La Grange, a large detached barn, has been fully restored over a five year programme and now offers an array of beautiful features. The entrance, from the private terrace ,is via a magnificent double height, arched oak doorway, leading to a large open plan lounge with a fabulous oak staircase and gallery. The lounge adjoins the large fully equipped fitted kitchen and dining area with farmhouse table, offering luxurious space even for the larger party .La Grange provides 5 double bedrooms and 3 bath/shower rooms.All rooms have beamed ceilings, original features and excellent views. The property has been completed with quality furnishings throughout. La Grange has its own large, private ,stone terrace with quality outdoor furniture, barbeque, ancient well and lighting.This leads onto the communal gardens and the large and secure swimming pool terrace. In 4 acres of grounds, on the edge of a tiny hamlet, close to the very pretty bastide village of Prayssas, Sainte Foy offers a stunning, romantic, panoramic holiday location. 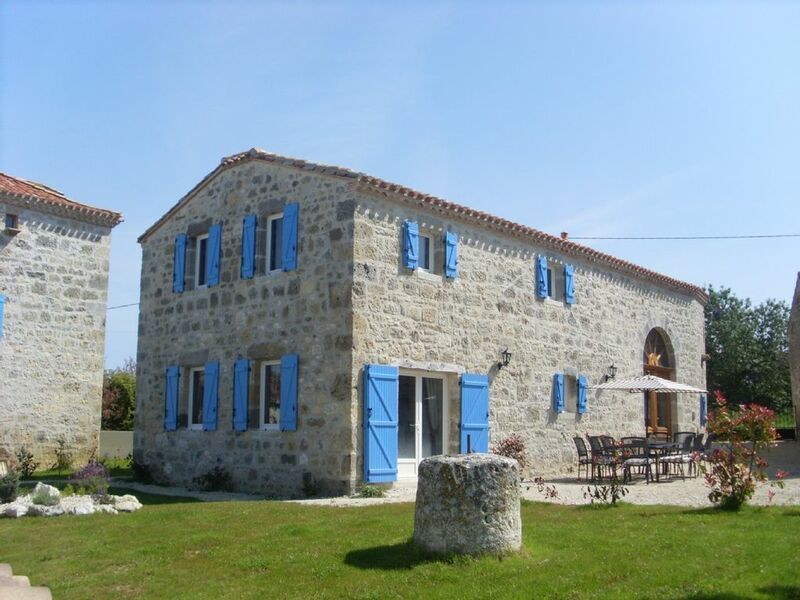 The properties offer complete tranquillity in beautiful surroundings, yet are close to all amenities in nearby Villeneuve-sur-Lot & Agen, providing the perfect self catering holiday. The detached properties, all with their own private terraces, share a large west facing, wonderful Pool Terrace, with a 12mtrs x 6mtrs salt-water pool , and offering fantastic views and sunsets over a vineyard and unspoilt countryside. Sainte Foy consists of 3 distinctly different detached properties; La Maison-the original, beautiful farm cottage; La Grange- a luxurious, spacious barn, and the very romantic & petit barn, Le Pigeonnier. All offer a range of unique and individual features, providing the basis for an unforgettable family or romantic holiday in this beautiful region of South West France. All bathrooms are equipped with washbasins and mirrors. The very large swimming pool and pool terrace are shared with the other two properties at Sainte Foy. A fantastic fortnight at La Grange in Sainte Foy! La Grange is the largest of Peter's three properties situated in the quiet hamlet of Sainte Foy, and whilst it is secluded, it is only a fairly short five to ten minute drive to the village of Prayssas (with small local supermarket) and a twenty minute drive to the town of Port-Sainte-Marie (larger Intermarche supermarket) with other larger towns a little further afield, so all in all, ideally located! The property's five bedrooms are roomy with comfortable beds (two double and three twins) with an electric fan in each and were ideal for the ten of us who were staying. There was also a sofa bed on the upstairs landing but we didn't use it. The living room and kitchen area are massive with a TV with UK free to air satellite channels (handy for the World Cup at the time! ), and the kitchen utensils etc. were generally sufficient, although just a couple more larger saucepans and some matching lids would have been handy, and a few more serving spoons (we bought a couple of cheap ones and left them there). The kitchen had one under counter freezer and two fridges, and a very large table but we ate outside every day! There are plenty of bathrooms/toilets with two proper shower cubicles and another over a bath, and we always had plenty of hot water with a very reasonable water pressure. The whole property was clean and tastefully decorated. Outside, there was a lovely large covered table area with plenty of seating plus a circular metal barbecue (charcoal - not gas) that we used on a couple of occasions. The grounds are extensive with beautiful views, and we were lucky enough to have the other two properties not occupied so we had the whole area and use of the facilities to ourselves. The pool is kept clean and massive, and we made use of the larges boules court and table tennis table, and there is also a footballing and badminton area and large field to enjoy. There is also a wooded area near the house and we occasionally saw a deer wandering through it and there was also pleanty of birds around to watch and listen to. Peter's son Dan (and partner) live on site in a small house and clean the pool and mow the grass etc. and to be there is we needed anything or any local advice, but otherwise we didn't see much of them. We loved our stay here and would thoroughly recommend the property and the surrounding area for a holiday in this region of France, in which there is plenty to occupy yourself with. We had a wunderful time at La Gange. It is a Beautiful house, nice and clean. The pool was a delight and the surrounding landscape is beautifull. Al you need for a lovely vacation. A beautiful property in a stunning location. We thought it looked beautiful on the website, when we arrived it was if anything better! There was everything we needed in the kitchen, the bedroom and bathroom were fine, there was then a spacious sitting room upstairs though in practice we didn't make much use of that as we were blessed with delightful weather for most of our stay. The pool was a delight, with stunning views, and we had a nice private eating area outside which we used for most of our meals - when not out and about. Plenty of good things to visit in the area. Real value for money! Despite making the small mistake of driving down from England (a long drive), when we arrived, we thought we'd found a little piece of heaven. The location and house were perfect and with a large extended family, the swimming pool was a welcome relief. The sun shone for a week and we enjoyed it all. The house itself was very spacious with a very large open lounge/kitchen and with 5 double bedrooms, we were all able to have our own space. Peter the owner very kindly accomodated my son in a wheelchair by building a couple of ramps before we arrived - incredibly kind. Along with a downstairs bedroom, he felt completely at ease and relaxed, as did we all. The grounds are extensive and gave plenty of areas for painting, walking and generally chilling out. The area itself is beautiful in all aspects with the local 'ville' as charming as you could find anywhere. I can honestly say that I would recommend this holiday to anyone who wants beautiful countryside, a beautiful house and beautiful memories. This is the perfect place to get away from it all and truly relax. La Grange is an ingenious stone barn conversion, both spacious and cozy at the same time. The kitchen has an envious amount of work surface, ideal for collaborative cooking. The massive dining table was perfect for long relaxing suppers. The bedrooms and bathrooms are all well furnished and felt well spaced out. Outside is another dining table where we enjoyed our breakfasts and lunches. The gardens and pool are magnificent, and the view is something that will stay with us forever. This was our second time staying at La Grange and fourth time returning to the area and as always we were not disappointed and had a wonderful stay. The barn is beautiful - spacious clean and very well equipped, truly providing a home from home experience. The complex is beautifully situated with a nice pool overlooking stunning countryside and the location is peaceful yet close enough to the nearby hamlet of Prayssas which provides all necessary amenities. We hope to return soon. There is an almost endless list of places to visit in the area, from wonderful scenery, ancient villages, beautiful architecture and sites of outstanding natural beauty. The area boasts some fine examples of bastide (fortified) villages. Pujols is only 15 mins away and is exceptionally pretty. Slightly further afield (30 mins) is Penne d’Agenias, an excellent example of a bastide village and extremely pretty. The local village of Prayssas is just 4kms away. This old bastide village is full of life in the summer months, extremely pretty and boasts all facilities, shops, restaurants, bar, post office & pharmacy. The two local towns (both approx 20 mins away) are Agen and Villenueve sur Lot. Both are very attractive and have excellent pedestrianised shopping areas in the town centres and a number of commercial centres on the outskirts with hypermarkets and other retail outlets. Agen is renowned for the aqueduct which carries the Canal du Midi across the Garonne river. Bookings are normally Saturday-Saturday.However, other start and finish days may be possible. Bookings are normally weekly but other periods may be possible. Bed Linen and House towels provided upon request at £15 per person. Refundable Security Deposit of £150 payable with final payment Discounts available for bookings of 3 weeks or more. A 25 % non-refundable deposit is payable on booking.